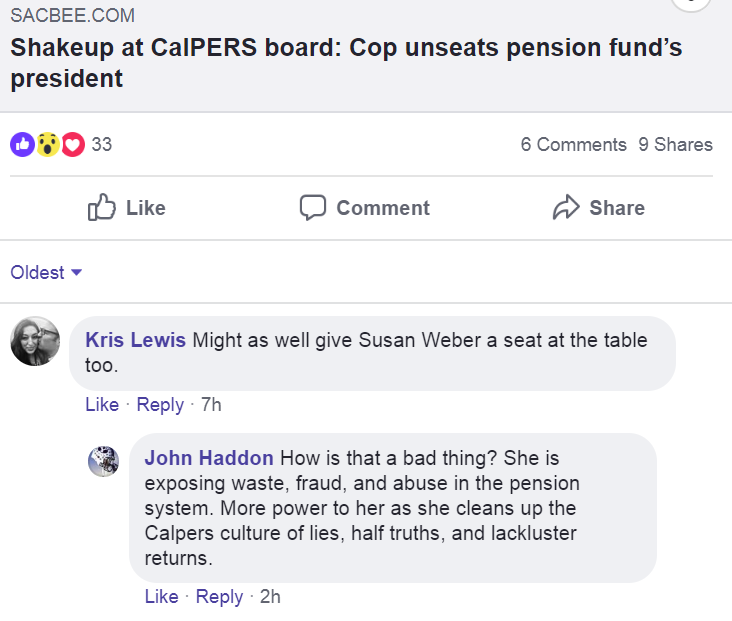 Last year, CalPERS insiders no doubt tried to rationalize Margaret Brown’s victory over long-standing board member and former CSEA president Michael Bilbrey as a fluke. On the board, Bilbery gave a very convincing imitation of a potted plant. Brown made Bilbery’s “missing while present” status as a board member who almost never spoke into a campaign issue. She had also won the endorsement of key retiree organizations, whose members have a high propensity to vote. Brown beat Bilbrey by 53% to 47%. Jason Perez’s defeat of high-profile board president Priya Mathur is an even more forceful blow to business as usual at CalPERS. This election was for the public agency local government employees board seat, so only current employees were eligible to vote. That should have given the unions more sway than for the “all member” seat that Brown successfully contested last year. But beneficiaries are correctly worried about CalPERS’s deeply underfunded status, at 71% even with market valuations of most assets at nosebleed levels. As a result, the press is no longer giving CalPERS the benefit of the doubt. And those who tune in and watch board meetings can readily see that the board refuses to discuss fundamental issues, most importantly the underfunding (save for Dana Holligner, who makes an occasional gripe for the record, knowing no one else will take it up). Union leaders have been preoccupied with inside-Sacramento political games, acting as if CalPERS can run on auto pilot because California taxpayers are ultimately on the hook. The rank and file’s repudiation of this cronyistic stance should serve as a big wake-up call. Mathur had barely retained her seat when she faced a challenger the last time she was up for reelection, despite her opponent being a vocal proponent of “reform,” as in cutting pensions, which is like trying to get turkeys to vote for Thanksgiving. But Mathur had a series of violations of disclosure requirements, both of financial conflicts of interest and campaign disclosures. She made her problematic history worse with her conduct as board president, a post she assumed this January. Mathur has a highly interpersonal orientation, prioritizing smooth relations over sound policy. She thus firmly backed staff and fellow board members in trying to leash and collar new board member Brown, who ran as a watchdog. Having Mathur defend now-departed Chief Financial Officer Charles Asubonten despite clear documentary evidence of him having committed perjury on his employment application, block board members from getting their mail and fail to stop the illegal practice of having board members pre-sign blank travel forms, made it all too visible that she’d back CalPERS staff no matter how indefensible their conduct was. The mail interception was particularly misguided. Brown says even now she has members of the public asking whether she is finally getting her mail. Jason Perez is a Corona City police officer and head of his union. Many law enforcement organizations endorsed Perez. Mathur was endorsed by SEIU, AFSCME California, and the California Professional Firefighters union. 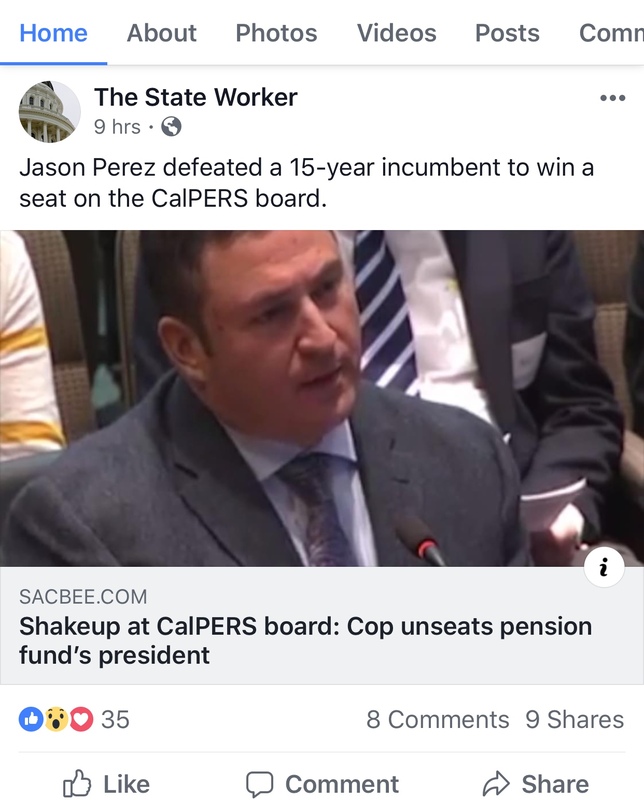 The fact that Perez beat Mathur so decisively despite her having the support of much more influential unions is a sign of dissatisfaction with how CalPERS is being run. Mathur was so fixated on ESG issues that, in combination with her traveling around the world on a frequent basis to speak at and participate in ESG conferences, it looked like she was positioning herself for future career opportunities at the expense of CalPERS beneficiaries. And her considerable charm and her leadership on key committees appears to have had the effect of the board as a whole similarly spending too much time on ESG at the cost of other investment topics. It’s easy to have an opinion on ESG matters and CalPERS could bask in being a prominent player in this arena. But that lead to atrocities like the board tolerating staff presenting documents to the press about its unprecedented, in a bad way, private equity scheme, that any competent organization would have regarded as an embarrassment for being so devoid of substance. If all you can show is a few slides with less than 500 words of text in total on them, it would have been smarter to wait and come up with better messaging. Perez was a first-time candidate who said when he launched his campaign that he wanted to run because he was worried about the $360 billion pension fund, and “I’m selfish; I want to retire.” At a debate, he said he wanted the pension fund to focus on maximizing returns from its investments. Lewis’ remark is yet another proof of how deeply captured the CalPERS board has become. It is apparently inconceivable to Lewis that it is normal and healthy for board members to operate independently and challenge staff members, particularly when they are acting in a self-serving or slipshod manner. The old normal at CalPERS, before the Fred Buenrostro era, was a highly engaged, vigorous board that did not hesitate to slap down staff when the board thought staff was over-reaching. This healthy tension between the board and staff was a central element to CalPERS once having been a widely admired institution. In other words, it is apparently so inconceivable to Lewis that board members are capable of speaking up that he assumes there must be a hidden hand somewhere. That’s an insult to Brown and Perez but comforting to people who’d rather resort to conspiracy theories than recognize that CalPERS is in desperate need of governance reform, and beneficiaries are so concerned that they are stepping forward to move CalPERS in a better direction. I hope you’ll all wish Perez success in his new role! 1 The comments on Facebook are not the same as the ones on the Sacramento Bee’s website. I am told by readers who use Facebook that Kris Lewis is a CalPERS employee and a Facebook friend of Ashton’s who chats with him regularly. This entry was posted in CalPERS, Corporate governance, Investment management on October 5, 2018 by Yves Smith. The big advantage of social media (and I’ll stretch this definition to include comments sections of the press) is that it allows off-the-cuff missives which lay bare the inner workings of people’s minds. It is as much a disadvantage sometimes because people do on occasions forget to engage their mental faculties before hitting they keyboard. However, when Kris Lewis can’t contain herself and lays into The Blog That Dare Not Be Named, that’s a big tell. In effect, Lewis is confirmation of a long-held suspicion here that the board are seen by CalPERS’ staff (and have, regrettably, come to see themselves in the the same light) as a group of well meaning but harmless ineffectuals who are there to sit round a mahogany table, watch the pretty pictures in the PowerPoint, drink the coffee and eat the cookies, have a nice day out generally and that’s their jobs done. Congratulations and good luck to you Perez. First stop for your investigations, where your background will stand you in good stead is CEO Marcie Frost. The one with a corporate wrongdoing rap sheet as long as your arm. Coffee is for closers good Sir…. FWIW, Kris is a he (the FB picture is of him kissing his wife and you see mainly her face) and works in the investment office. Bye bye Priya. You will not be missed. NC – well done, you’re making a difference! Does this mean Perez will be the new board president? Or do they elect a new one? The board will elect a new board president. The board president among other things gets to assign who sits on which committees, aside from the two committee of the whole (the Investment Committee and the Board of Administration). So, for instance, when the board was out to get JJ Jelincic for his supposed leaking (which they never proved; in fact, some of the things he allegedly leaked were public information), then board president Rob Feckner made sure Jelincic had fewer committee assignments than other board members. A very good scalp – Yves can take enormous credit for this, even if Perez sounds like someone maybe a bit too focused on the bottom line. But having experienced senior managers who operated like Mathur – and seeing the pernicious way they weaken organisations in order to boost their own profiles – it can only be good news for Calpers pensioners. And yes, that Kris Lewis posting is very, very revealing of a certain mindset. TBH, if I was a CalPers beneficiary, focusing on the bottom line is way better than what the current board/CEO was heading for – like handing more money to PE via various fees and suchlike. It needs to be less of a chatty club with benefits, and more of a pension fund. Priya, Priya, wouldn’t want to be ya. Right! Now that that is sorted. Who else is next up for re-election and when is it exactly? This is looking more and more like a Chinese firecracker effect at work here that I would date back to the election of Brown. That Kris Lewis, by the way, apparently does work for CalPERS as I have found their name in connection with CalPERS in different events. Hmm – Susan Weber on the board. You know, that is not such a bad idea that – so long as she could bring along a blacksnake whip. Crap though its a long uphill battle to reform corporate architecture to serve society and not just enrich itself through game theory machinations…. Kudos to both your skill and form…. Good work. Always press on when the iron is hot. Having two board members who aren’t casually corrupt is a 100% improvement. Yve.s thank you for staying on top of this! Was this the election in which the ballot counting methods had been criticized? Yes done in Washington state. CALIFORNIA jobs taken again. Margret was not allowed to observe this time around by Priya. I went to the counting in Washington on my own dime. Unfortunately there was no counting. Only scanning of the ballots. More to come from Yves on the process in Everett WA and La Jolla CA. Well I hope this election isn’t to late to stop the private equity scheme plans. There is such a rush to hide billions of fund money for high priced investing. Jason comes on board Jan and this Marcie scheme is planned for December. Demand a stop now. Do CalPERS board members and staffers have to sign ethics disclosures about any remuneration (cash, in-kind, any) from whatever source? If so, that could be interesting reading along with employment after leaving that organization. Revolving doors, golden welcomes and similar should be made known to the fund contributors. Your comment triggered a thought. Now that Priya Mathur is on the way out, will the Board give her a golden handshake? They were awfully generous with Frost recently so I was wondering if they could legally throw some largess her way as she goes out the door. Don’t know if the Board itself would have to approve this. Board members, investment staff and some other CalPERS employees are required to file an annual Statement of Economic Interest (From 700) each year. CalPERS used to post the Board members forms on line but stopped after 2016. Better to ask about All the boards they sit on in addition to CalPERS. How are they protected from performing their fiduciary duties. Actually listen to members and help fix the problems they point out don’t just report we talked. Put our comments into the record. Bring back risk adjustment to health plans and stop trying to eliminate PersCARE. Congratulations to Mr. Perez. And to Yves and NC for showing us all how to fight public corruption, and blazing a trail for others who wish to do so. Yes, Yves is a national treasure! Californians, at least, should name a Redwood grove in her Honor. Thank you for your continued reporting on CalPERS, PE, and pensions. Let’s keep this in perspective: former Board president and CalPERS Board-Member-For-Life Rob Feckner (an erstwhile glazier for a semi-rural school district) and Board Member Theresa Taylor (a SEIU and CSEA official and Sacramento insider) ran unopposed. Feckner’s 12 terms as Board president and Mathur’s tenure on the Board overlapped the “pay-to-play” scandal in which the then-CEO steered $120 Million in fees (a conservative estimate in the “Steptoe Report”) to former Board members and former CalPERS staffers acting as “placement agents” with special access to the CalPERS Investment Office. The former CEO is the only person ever convicted of a crime as a result of this scheme and it’s questionable whether claimed “fee rebates” ever resulted in actual net recoveries, since CalPERS is still paying fees to the firms involved in the scandal. Instead, under Feckner’s presidency a white-collar criminal defense attorney with no experience in finance was made General Counsel of the fund, and there is no more (and probably even less) transparency about fees than before the scandal. I have met Jason Perez. He is a good man. However, Feckner, Mathur, and General Counsel Matt Jacobs have left him to deal with a patently unconstitutional “Board Governance Policy” that will be used to muzzle his curiosity about how unjustified assumptions, high fees, and heads-I-win-tails-you-lose deals are eating-away at returns. It’s truly frightening to me as a beneficiary that in the current “bubble” and using an overly-optimistic 7% return assumption, their high-school educated CEO can only report that CalPERS 71 percent funded.